The Creekside Studio is an outdoor environment designed for communal gathering, art making and engaging with nature. This new space at Montalvo was produced by landscape architect Jeffrey Miller in collaboration with visual artist Amy Trachtenberg. The first phase of the project involved creating a terraced landscape, revitalizing and expanding two existing shed structures, and crafting handcrafted benches and worktables surrounded by new native plantings. Trachtenberg’s artwork Counterpoint is integrated into the site. Operating at the intersection of painting, sculpture and architecture, a series of brightly patterned shed doors constructed from repurposed building materials and a vividly colored patchwork shade cloth draw visitors to the Creekside. Miller and Trachtenberg have transformed an underused area, opening it up for public use. The Creekside Studio will serve as a classroom space for education programs, offer opportunities for engagement with Montalvo’s diverse natural environments, and provide a space for interaction between resident artists and Montalvo's wider communities. The Creekside Studio was made possible through the generous support of the David & Lucile Packard Foundation and Susan and Bob Finocchio. Shadecloth fabrication by North Beach Marine Canvas - Liz Diaz, Master Fabric Craftsman. 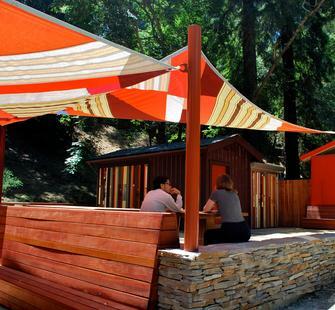 Creating a functional context for outdoor communal gathering The Creekside Studio is a new locale for resident artists, summer youth camps and the wider community at Montalvo. The collaboration reveals the space as a container for physical and social connections adjacent to Wildcat Creek. In the first phase of the project, Miller envisioned a terraced space centering on two revitalized shed structures, handcrafted benches, work tables and a sink nestled in a surrounding of oak trees and ancient redwoods. As an armature for multiple forms of interactivity, the studio’s new native plantings contribute to Montalvo’s Arboretum. While organizing and creating new circulation and usage patterns, The Creekside Studio emphasizes Montalvo’s potential to perform its ripple effect in the landscape for a widening sense of art making and community. Hovering between painting and sculpture, Trachtenberg’s two-part piece, Counterpoint comprises the Patchwork Shadecloth and Striped Shed Doors. The abstract assemblages of strips of cloth and repurposed building materials in the open air draw connections between the natural and the manmade. Building with cast-off materials in her work, the history of prior use creates a commentary on materialism and calls upon improvisation.